Team 7 Racing of Columbus Georgia is pleased to announce a new partnership with Super Charged of Cataula Georgia for the upcoming 2018 Southern Outlaw Drag Racing Series. Mack Gouge, Team Principle of Team 7 Racing said, “We’re excited to team up with Super Charged. Drag Racing and Super Charged seem to be a perfect fit. Super Charged will be our Primary Sponsor on our Drag Car this season”. Nick Smith of Super Charged commented, “We at Super Charged Natural Energized Sports Drink are looking forward to creating a new synergy within the motorsports market place. Team 7 Racing has a long history of being a winning operation in many motorsports disciplines”. 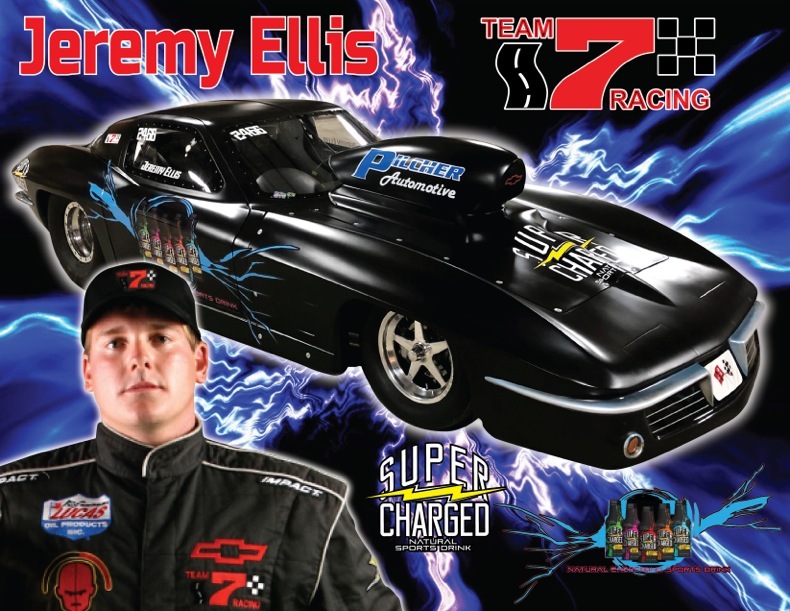 The driver that will be piloting the Team 7 Drag Car will be Jeremy Ellis of Columbus Georgia. Jeremy has been with The Team 7 Racing 10 years. He has won two ORSCR Championships while driving for Team 7 Racing. In 1974 Mack Gouge founded Team 7 Racing, and started racing in The Sports Car Club of America (SCCA) Regional and National events. Gaining experience in Road Racing, Team 7 Racing has gone on to claim several Championships and many victories in SCCA Road Racing and Drag Racing as well. Team 7 Racing is dedicated to winning as a top tier race team. Building strong relationships with our partners through creative and exciting marketing campaigns and hospitality events, maximizing return on your investment. This success has been based on our strong core values of: Desire, Dedication and Determination. Team 7 Racing moved into their current race shop in 2001, a 10,000 sq. ft. state of the art facility, capable of supporting a multi-car team. Super Charged Natural Energized Sports Drink was started by Nick Smith of Cataula Georgia. Super Charged is not just another sports drink in the marketplace. Super Charged is a Sports Drink that is made of all natural ingredients. Buzz My Biz, LLC specializes in providing premium web development and search engine optimization services. We provide affordable websites that features HD video, amazing graphics that are full of SEO (search engine optimization) to make sure that your site gets found on Google for search terms your customers will be looking for. © 2015 Team 7 Racing, All Rights Reserved.